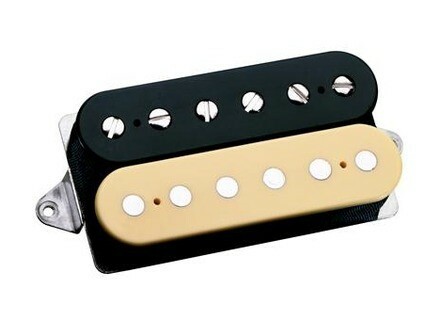 Hatsubai's review"Amazing PAF Neck Pickup"
Awhile back, DiMarzio released these pickups, and they’re still not as popular as they should be, for whatever reason. They’re aimed to appease the boutique pickup crowd and rival the PAF variants that so many people make. These pickups are open, have amazing note clarity and sound like some of the best PAF clones out there … maybe even better. Like nearly every DiMarzio pickup out there, these come with four conductor wiring, so you can wire it in any way you’d like. 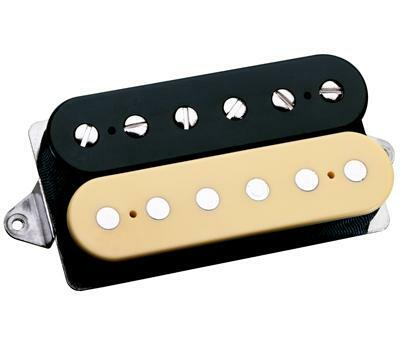 The pickup also has adjustable screw pieces on one coil with regular slugs on the other. DiMarzio really did an amazing job with this pickup. It’s so good that it’s scary. This is one of those pickups that sounds awesome no matter what guitar you put it in. The neck has this low end that just blooms, and the high end on this warm. It reminds me almost of an Air Norton without the muddiness. It has more clarity than the Air Norton and PAF Pro, too. There’s no nasty compression going on that messes up your tone. Just like the bridge pickup, this is aimed at the more low output pickup crowd. If you’re looking for a pickup more suited for metal, you probably won’t be looking at this pickup as it won’t compress like the other high gain pickups out there. However, it can still do an awesome 80s rock/metal tone going on with the correct guitar. Don’t forget, most of the pickups used back in the early 80s were just regular Seth Lover PAFs in Gibsons. If you’re looking for a low to medium output neck pickup that sounds like a vintage PAF, sounds open and has tons of note clarity, I highly recommend checking this pickup out. It’ll fit with nearly any tone wood, and it’ll work great with both Les Pauls and Strats alike. The best thing is that it doesn’t cost a ton of money like so many other boutique pickup manufacturers out there. I installed the PAF DP103 36th Anniversary two weeks ago on a Les Paul type guitar. From the first test, I found it sounded much better than original pickup (which sounded good but not full enough) and the Seymour Duncan SH2N Jazz model I had installed two months before. The SH2 sounded very good with a wide dynamic range and a strong sound character. But the DP103 sounds more subtle and smoother when you play soft attacks or reduce the control volume. It has a good dynamic response when you play stronger attacks and it doesn't produce any signal peaks with each attack like the SH2 does. With clean sounds on a lead channel (I use a Laney tube amp and Tonelab LE) the sound ranges from dirty clean to generous, mellow and singing distortion. Strong and accurate low frequency response. Smooth and consistent high frequency range. Solos with bending sound great. I even tend to play rhythm parts at the top-end and solo parts at the low-end of the neck. I added a split this week. I get a rich and well-balanced single coil sound useful for clean rhythm parts and distorted solos. In combination with the split bridge pickup (a DSP223 36th Anniversary) I get a well-defined sound perfect for funky rhythm parts. It obviously doesn't sound like a real Strat. But it offers a good-quality single coil sound. The sustain is better with the DP103 and DP223 than with the original pickups or the SH2 and SH2B combination. I bought the worn nickel version secondhand on the web. Very good value for money. I wouldn't hesitate to buy it again! I find this pickup is perfect for almost every music style (from blues to Santana) with a mahogany guitar. With the DP223 in bridge position you get the perfect balance. Phil7292's review (This content has been automatically translated from French)" Vintage and shiny"
I installed the DP103 PAF 36th Anniversary weeks ago on a guitar type Lespaul. Ds the first test, I found it much better than the original microphone, which n'tait not bad, but lacked safe, and that SEYMOUR DUNCAN JAZZ MODEL SH2n I install it two months ago. The SH2 silent trs well, with the dynamics and grain. But the DP103 is more subtle, softer when you attack that one sentence or decrease the volume, with a large dynamic ds that attack, but not with the "spike" in attacks that beginners 'was systmatiquement with SH2. Clearly, playing with volume and channel mdiator a well saturated (LANEY lamp and ToneLab LE in my case), moving from one's just a natural distortion crunch trs gn reuse, smooth and flte. The bass is strong but not absolutely drool. The highs are smooth and consistent. The solos with sharp bends in the show a well "tube" totally enjoyable. I can almost make my rhythm on the treble and go solo on this serious. This week I installed a split. This gives a rich sound simple, equilibrated trs exploitable clean rhythm and solo saturated. In combination with the microphone too acute Splitt (a DP223, the 36th Anniversary bridge), we obtain a well Tees nickel to make casseroles. This does not apply to simple strat. Srement, but it has its micro crdible simple gadget that is not. The sustain of the guitar is better with the DP103 and DP223 with the microphones or the original duo and SH2n SH2B. I bought it on the net to OCCAZ version states "worn nickel" (wholesale antique nickel cover) for 70USD. So I think the report is qualitprix trs good. I would do without this choice hsitation. This microphone is perfect for little prs my opinion, and great for blues and stuff on a fawn SANTANA scratches in mahogany. Coupled to DP223 in acute, we obtain a perfect balance.